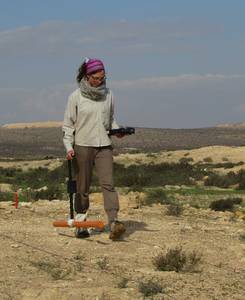 During my GSGS Start-up honours Grant, I continued the investigation of the archaeological site Elusa in the Negev (Israel) under the supervision of Prof. Dr. Tezkan (Geophysics) and in close collaboration with Prof. Dr. Heinzelmann (Archaeological Institute of the University of Cologne). Furthermore, the site has been the target of geophysical prospections using magnetics and ground penetrating radar (GPR) in the framework of my Master's thesis. Elusa was approximately founded during the third century B.C.E. by the Nabataeans as a caravansary along the Nabataean Incense Route. Elusa developed to an important settlement with urban character, e.g. the only known theater of the Negev is located in Elusa. Probably during the eighth century C.E., the site was abandoned. Since 2005, Elusa is - among other cities in that area - part of the UNESCO World Heritage “Incense Route - Desert Cities in the Negev“. For my PhD thesis, we are preparing a proposal on further investigation of the site using the electromagnetic induction (EMI) device CMD Mini-Explorer by GF Instruments. Most common methods in archaeological prospection (magnetics, GPR and geoelectrics) only map one material constant of the subsurface. The advantage of EMI measurements over these methods is that both the electrical and the magnetic properties of the subsurface are mapped at multiple depths during one measurement. This method thus facilitates the detection of archaeological structures in the subsurface which differ from the surrounding material in their electrical and/or magnetic properties. In addition, EMI data can be used to determine the depth and thickness of subsurface structures that are of interest e.g. for planning archaeological excavations or for evaluating the preservation of archaeological sites. To exploit the advantages of EMI measurements, an inversion of calibrated EMI data is necessary. Environmental influences cause a shift in the measured apparent conductivities, which can be corrected by a calibration with electrical resistivity tomography (ERT) data . EMI and ERT data are generally inverted separately. We are going to develop a new inversion algorithm for jointly inverting the data1. Furthermore, the inversion of the magnetic properties is going to be included. During the first part of the grant, I did literature research on EMI measurements in general, their application on archaeological targets, their calibration, their inversion, and the concept of joint inversions. As a preliminary study, I participated in a field campaign of the Archaeological Institute at Elusa (Link) during February and March 2015. While a group of archaeology students under the supervision of Prof. Dr. Heinzelmann was excavating, I conducted test measurements with the CMD Mini-Explorer which was provided by the work group of Prof. Dr. van der Kruk of the Jülich Research Center. The aim of these test measurements was to evaluate the feasibility of mapping the same archaeological subsurface structures which were mapped via magnetic investigation with the CMD Mini-Explorer. Furthermore, several ERT profiles were measured to firstly calibrate the EMI data and secondly to investigate the depth of particular archaeological structures. Currently, the data are being analyzed and modeling studies are being conducted. Subsequently, the data and the results of the modeling studies will be used as preliminary work for a proposal to the German Research Foundation (DFG). At this stage, the proposal is in preparation and the theoretical framework of possible methods is revised. Beyond that, it is intended to continue the collaboration with Prof. Dr. Heinzelmann on archaeological targets. I would like to thank everybody who supported me and this project so far. In particular, I would like to thank the GSGS for the generous sponsorship. I am especially thankful to Prof. Dr. Tezkan and Prof. Dr. Heinzelmann for their supervision as well as to Prof. Dr. van der Kruk for the opportunity to use their device for our test measurements. 1Lavoué F., van der Kruk J., Rings J., André F., Moghadas D., Huisman J.A., Lambot S., Weihermüller L., Vanderborght J. und Vereecken H. (2010): Electromagnetic induction calibration using apparent electrical conductivity modelling based on electrical resistivity tomography, Near Surface Geophysics, 8:553- 561. Mester A., van der Kruk J., Zimmermann E., Vereecken H. (2011): Quantitative Two- Layer Conductivity Inversion of Multi- Configuration Electromagnetic Induction Measurements, Vadose Zone Journal, 10, 1319- 1330.